Rebecca Beatrice Brooks December 21, 2017 November 13, 2018 1 Comment on What Caused the American Revolution? 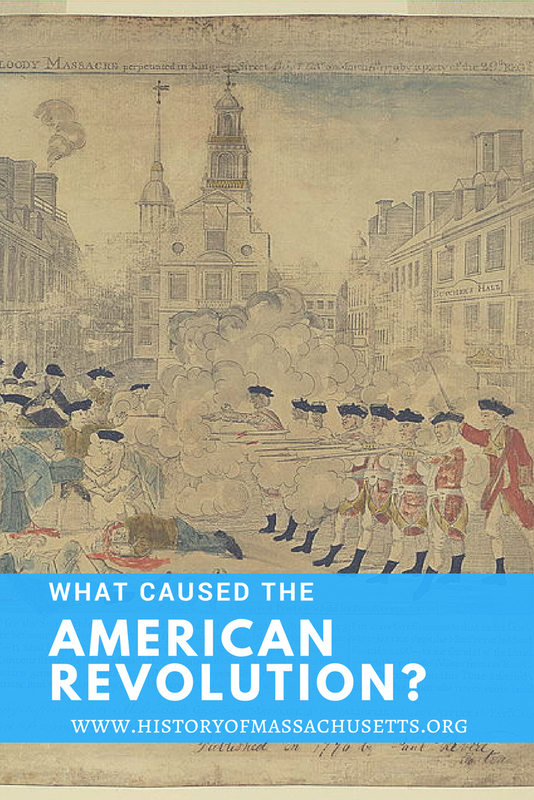 Trying to pinpoint the main causes of the American Revolution is difficult at best because there were many contributing factors and even historians can’t agree on what they were. Author and Harvard professor, Bernard Bailyn argues in his book, The Idealogical Origins of the American Revolution, that one of the underlying causes of the American Revolution was a growing belief among colonists that the British government was secretly conspiring to create an autocratic government in which the King would have unlimited power. The following is a list of some of the events that colonists believed were signs of a government conspiracy at work. After the French and Indian War ended, the British government issued the Proclamation of 1763, on October 7, 1763, which forbade colonists from settling the land west of the Appalachian Divide. The proclamation also prohibited private citizens and colonial governments from buying land from natives or making agreements with them, stating that only the British empire could conduct these official relations. Furthermore, only licensed traders would be allowed to travel west or trade with the natives. The proclamation was intended to prevent the outbreak of another costly war like the French and Indian war by preventing further expansion into the contested areas. it was also intended to keep the colonists near the coast. New settlements further inland would cost the government a lot of money in roads, protection, security and local governments. Since the British government was already in heavy debt due to the cost of the war, it couldn’t afford to invest in new settlements. Limiting colonial expansion to the area east of the Appalachian divide meant the colonies would expand west only when the government was financially able to do so and would avoid anymore costly Indian wars in the process. Yet, the colonists ultimately saw the proclamation as an attempt by the British government to put its own needs and interests first instead of serving the interests of its people, as they believed governments should do. The colonists believed they earned the western lands when they fought for the British government in the French and Indian War and saw this denial of their hard-earned reward as a betrayal. In 1760, the Anglicans in Boston began building Christ Church in Cambridge, which was a mission church built by the Society of Propagating the Gospel in Foreign Parts. The S.P.G. was an Anglican missionary organization dedicated to converting Native-Americans into the Anglican faith. In response, in 1762, the colonists created their own mission society, called the Society for Propagating the Gospel Among the Indians of North America, to convert natives to the Congregationalist faith instead. In England, the Anglican Archbishop of Canterbury found out about the program and convinced the privy counsel in London to terminate the society’s charter in May of 1763. Also in 1763, Reverend East Apthorp, the Anglican minister at Christ Church in Boston, published a pamphlet, titled Considerations on the Institution and Conduct of the Society for Propagating the Gospel, that supported the Society of Propagating the Gospel in Foreign Parts missionary work to bring the Native-Americans in the colonies into the Anglican faith. In response to this pamphlet, Reverend Jonathan Mayhew of Westfield, caused a stir when he published his own pamphlet, titled Observations on the Charter and Conduct of the Society for the Propagation of the Gospel in Foreign Parts, which argued that the S.P.G. in London was secretly conspiring to install an Anglican bishop in the colonies. In the late 1760s and early 1770s, the violent deaths of two young boys at the hands of British officials stoked fears that the British government was out to terrorize its citizens in an attempt to control them. 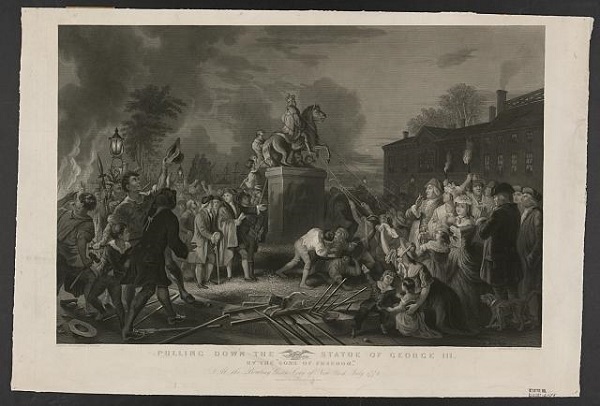 On May 10, 1768, a mob assembled at St. George’s Fields in London in support of imprisoned John Wilkes, a radical member of Parliament and a patriot-sympathizer who had been arrested for writing an obscene poem about a courtier named Fanny Murray. The mob in St. George’s Fields was fired upon by a regiment of Foot Guards and several people were killed, including a young boy who was wrongly identified as the leader of the mob. Rumors began to swirl that the “massacre” had been deliberately planned by British officials. These rumors were echoed loudly in the North American colonies and when a similar event occurred in Boston on February 22, 1770, during which a 10-year-old boy named Christopher Seider was shot by a British customs official during a riot, the colonists felt it was more than just a coincidence and was evidence that “the two events were two effects of the same cause” (Bailyn 115). 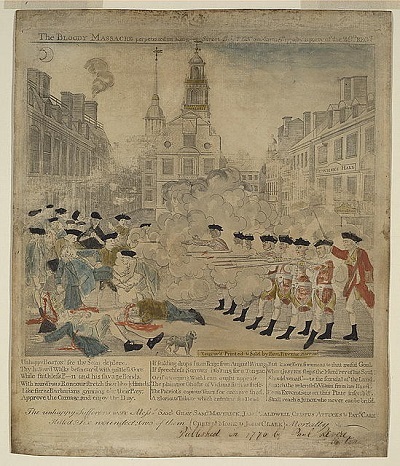 A few weeks after the Boston Riot shooting, the Boston Massacre occurred, on the night of March 5, 1770, during which British troops shot and killed five protestors outside the State House on King Street in Boston. The event erased any doubts that the troops were actually a standing army sent there to terrorize, intimidate and force the colonists into complying with the new laws. The acquittal of the soldiers the following autumn only strengthened these beliefs. It also didn’t help that in Boston, where the trial was held, there was a suspicion of judicial irregularities. The trial was later denounced by the colonists as a “mock trial” in their list of grievances against the King in the Declaration of Independence when it was adopted on July 4, 1776. In 1763, Great Britain was deeply in debt due to the cost of the French and Indian War, aka the Seven Years’ War, and also needed money for more troops to secure the newly acquired land won during the war. To help pay down this debt and raise money for troops, Great Britain began imposing a series of new taxes designed to generate revenue from the 13 colonies. The Sugar Act of 1764 was the first attempt to tax the colonies. The act placed a tax on sugar and molasses imported into the colonies. Colonists resented the tax because they believed Britain had no right to tax for revenue without the colonists having representation in Parliament. The response to the Sugar Act was moderate except for people such as Samuel Adams who saw it as an infringement on their rights and liberties and believed it was just the beginning of even more violations of their rights. Also in 1764, the Currency Act was passed, which regulated paper money by forbidding the colonies from issuing paper money. The colonists believed the act was an attempt by the British government to gain control of the colonies’ monetary policies and felt the British were asking the impossible in demanding payments in gold or silver when these resources were continually being drained in the colonies. In 1765, the Stamp Act was passed, which was a tax on all paper used for printed materials in the colonies. This act made many colonists realize for the first time that the British government could act contrary to the colonies’ interests. Colonists disagreed with the Stamp Act because they believed Britain had no right to tax the colonists without representation. 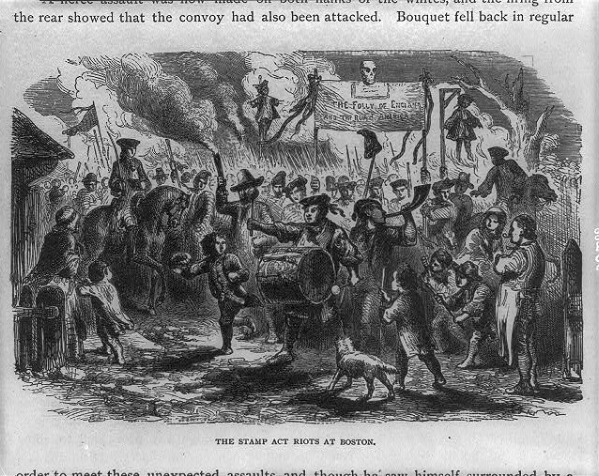 It was the first act that colonists took to the streets to publicly protest, such as in August of 1765, when the Stamp Act Riots occurred in Boston. In the wake of the Stamp Act crisis, Benjamin Franklin, who was working as a representative of the colonies of Pennsylvania, Massachusetts, New Jersey and Georgia, addressed the House of Commons at Parliament in 1766 and answered questions about taxation in America. “Q. Can anything less than a military force carry the Stamp Act into execution? A. I do not see how a military force can be applied for that purpose. “Q: And have they not still the same respect for parliament? A: No, it is greatly lessened. Q: To what causes is that owing? In 1767, the Townshend Acts were passed, which were a series of taxes on imports, and consisted of the Revenue Act of 1767, the Indemnity Act of 1767, the Commissioners of Customs Act; the Vice Admiralty Act; and the New York Restraining Act. The Revenue Act of 1767 placed a tax on British goods imported into the colonies such as glass, tea, lead, paints and paper and also paid the salaries of superior court judges, which used to be paid by the colonial assembly. Colonists opposed the Townshend Acts because they felt it was wrong to tax the colonies without representation in Parliament. They responded by organizing massive boycotts of British imports. Colonists also opposed the Vice Admiralty Act because it made it so that offenders of maritime law, such as smugglers, were tried in admiralty courts without juries. In response to the Townshend Act boycotts and the Massachusetts Circular letter, Lord Hillsborough, Secretary of State for the Colonies, dispatched two regiments, consisting of 4,000 troops, to restore order in Boston and enforce the new laws. The troop ships arrived in Boston in September of 1768. In 1773, the Tea Act was passed which allowed for tea to be shipped by the British East India Company duty-free to the colonies, thus allowing them to sell the tea for a discounted price but with a small tax. Even though British tea became cheaper, colonists still opposed the act because they were being taxed without representation and feared that the act would give the British East India Company a monopoly on the colonial tea trade. The tea act is what prompted the Boston Tea Party in December of 1773, during which several hundred protestors boarded merchant ships in Boston harbor and destroyed millions of dollars of British tea by throwing it overboard. In 1774, the Coercive Acts, aka the Intolerable Acts, were passed, which were a series of four acts designed to restore order in Massachusetts and punish Boston for its rebellious activities. The acts were the British government’s response to the Boston Tea Party. These acts included: The Boston Port Act, Massachusetts Government Act, Administration of Justice Act, the Quartering Act and the Quebec Act. The Boston Port Act closed the port of Boston until damages from the Boston Tea Party were paid. The Massachusetts Government Act restricted democratic town meetings and turned the governor’s council into an appointed body. The Administration of Justice Act made British officials immune to criminal prosecution in Massachusetts. The Quebec Act extended freedom of worship to Catholics in Canada and granted Canadians the continuation of their judicial system. Colonists found this distressing because they disapproved of allowing Catholics to worship freely in the colonies. The Coercive Acts were intended to suppress the growing rebellion in Massachusetts and isolate it from the other colonies. Instead, they were deemed so oppressive that it prompted the other colonies to come to Massachusetts’ defense and form the First Continental Congress to discuss creating a united resistance against British rule in the colonies. The colonists saw all of these acts as an infringement on their liberties and, at the heart of it, they feared they were just the beginning of something far worse. They felt these acts were the start of bigger and more expansive government policies and they felt they had to act to make sure that didn’t happen. Bell, J.B. A War of Religion: Dissenters, Anglicans and the American Revolution. Palgrave Macmillan, 2008. Franklin, Benjamin. The Political Thought of Benjamin Franklin. Hackett Publishing Company, Inc, 2003. Ferling, John. Whirlwind: The American Revolution and the War That Won It. Bloomsbury Press, 2015. Bailyn, Bernard. The Idealogical Origins of the American Revolution: Fiftieth Anniversary Edition. The Belknap Press of Harvard University Press, 2017.